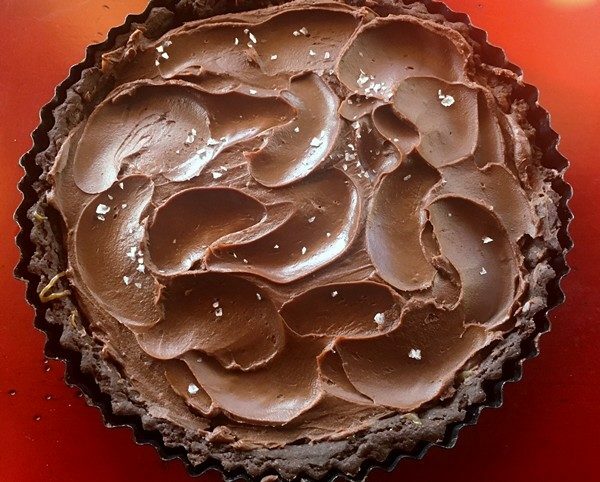 This salted caramel chocolate tart recipe from bon appétit looks complicated but if you’ve made tarts before, it’s not hard. You’ll need to devote some time to the process but a lot of it can be done ahead of time, chilled and assembled later. It’s all worth it! Check out “my verdict” for some tips before you start. Whisk cocoa, sugar, salt, and 1⅔ cups flour in a medium bowl. Add butter and toss to coat. Using your fingers, smash butter into dry ingredients until it nearly disappears (you shouldn’t see any large bits) and mixture holds together when squeezed—you’re working it more than you would pie dough. Make a well in the center and add yolk and milk. Using a fork, gradually incorporate flour mixture until you’ve got a shaggy dough. Knead a couple of times in bowl until no dry spots remain, and dough is smooth. Flatten into a ¾”-thick disk, wrap tightly in plastic, and chill until firm, about 2 hours (if you’re making the caramel, you can make it while the dough is chilling). Preheat oven to 350°. Let dough sit 5 minutes to soften slightly. Roll out on a lightly floured surface to a 14″ round about ⅛” thick, dusting with more flour as needed to prevent sticking. Lift dough on one edge and throw a pinch of flour on surface. Slide the removable bottom of tart pan under dough, positioning it roughly in the center. Fold the edges of the rolled dough inward toward the center, working all the way around so it rests on top of the tart pan bottom. Then lower it into the tart pan. Unfold the edges so they gently slump against the sides of the tart pan and the excess dough is hanging over the edges. Press dough firmly into bottom of pan with floured hands, then firmly press sides of dough into grooves and up sides of pan. Use a rolling pin over top edge of pan to shear off excess dough. Reserve dough scraps for patching any potential cracks later. Prick bottom of dough all over with a fork and chill in freezer until very firm, 10–15 minutes. Place tart pan on a rimmed baking sheet and line with a sheet of parchment paper or foil. Fill with pie weights or dried beans and bake until edges of crust are set and starting to look dry, 12–15 minutes. Carefully lift parchment with weights. Patch any visible cracks with reserved dough. Return crust to oven and bake until firm and dry all over, 18–22 minutes. Transfer to a wire rack and let cool. Bring sugar, cream of tartar, and ⅓ cup water to a boil in a large saucepan over medium-low, stirring with a heatproof spatula until dissolved. Cook, swirling pot often but not stirring, until mixture turns deep amber and wisps of smoke rise from the surface, 8–10 minutes. Remove caramel from heat and immediately stir in butter a piece at a time until smooth (be careful; mixture will sputter). Gradually stir in cream, then add salt. Transfer caramel to a heatproof measuring glass (you should have about 1½ cups). Let cool until warm. Pour caramel into cooled tart shell. Chill until caramel is set, at least 1 hour. Place chocolate, cream, and butter in a heatproof bowl set over a saucepan of simmering water (bowl should not touch water). Stir with a heatproof spatula until ganache is smooth, about 5 minutes. Let cool until thickened enough to hold an indentation from a spoon—if it’s too warm, it won’t hold its swirls. 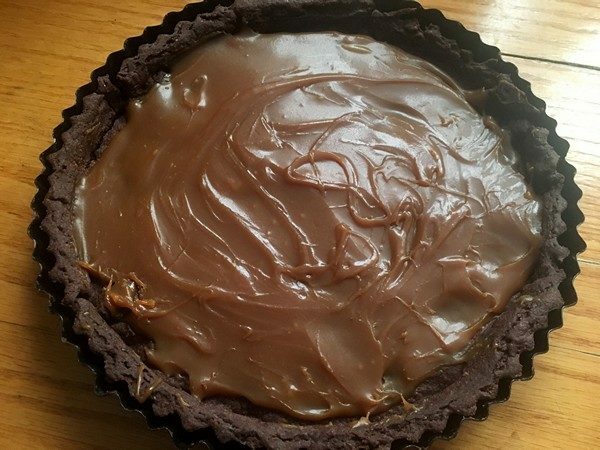 Remove tart from refrigerator and scrape ganache over caramel. Using a spoon, gently work ganache over surface, creating decorative swooshes and swirls. Sprinkle with sea salt; let sit until ganache has lost its sheen, 10–15 minutes. My verdict: This was totally worth it! 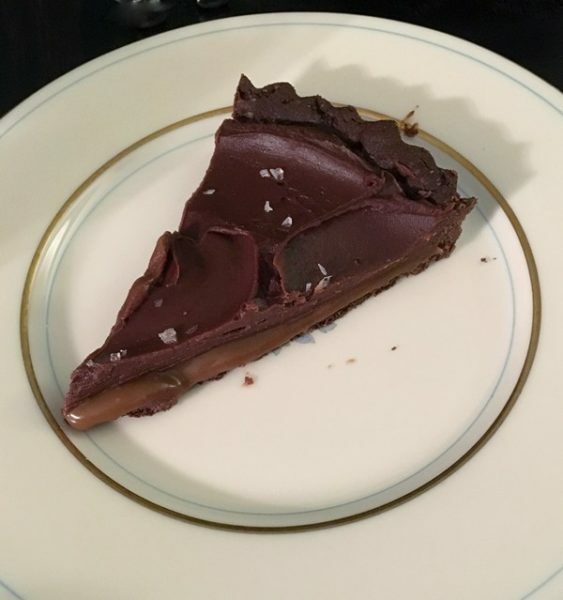 Amazing salted caramel chocolate tart! As I said in the beginning, it needs lots of time (mostly cooling and resting), which I didn’t plan for when I was making it. First, I made the dough in the food processor. It was fine, but I did end up putting it in a bowl and kneading it by hand until everything was incorporated. Not sure that the food processor saved any time. There was a lot of dough leftover, so I rerolled it and made three mini tart shells for future use (not sure how that’s going to work). I mixed some cocoa powder in with the flour when I was rolling out the dough, so there wouldn’t be a lot of white flour marks on my dough. My big hack on this was using a 6-ounce jar of my friend Kristin’s Cara-Sel amazing salted caramel sauce for the filling. I’m lucky enough to have easy access to it, you should just order some and thank me later. The ganache took forever (i.e. more than 10 minutes) to cool until it was workable. If I had to guess, it’s about an hour. I was in a hurry, so I tossed the (metal) bowl in the freezer and it chilled to the right temperature in about 10 minutes. Thanks for the great caramel sauce! It made the tart!